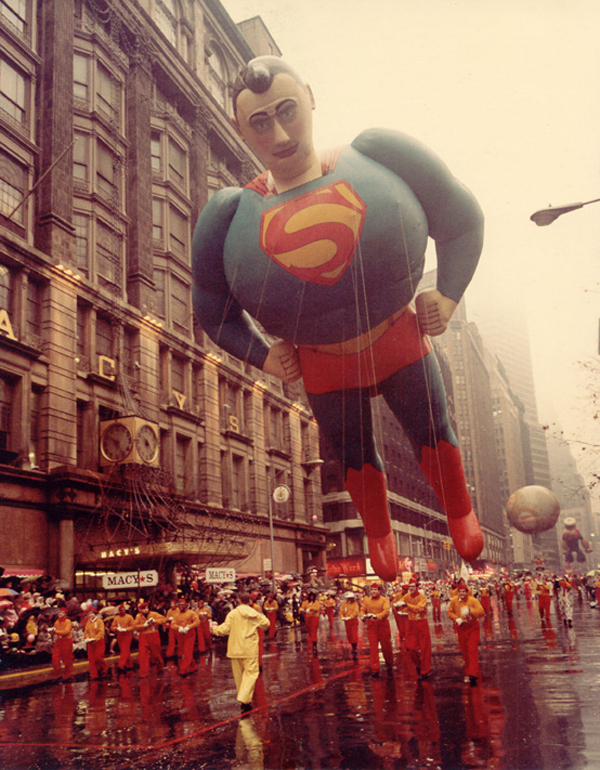 Vintage Flashback:: Macy’s Thanksgiving Parade! 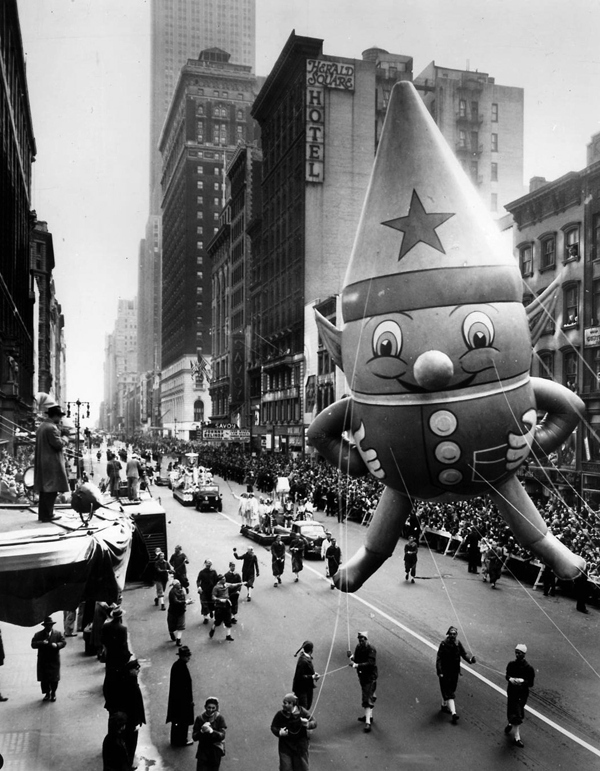 When I was a kid, Thanksgiving was all about the PARADE. 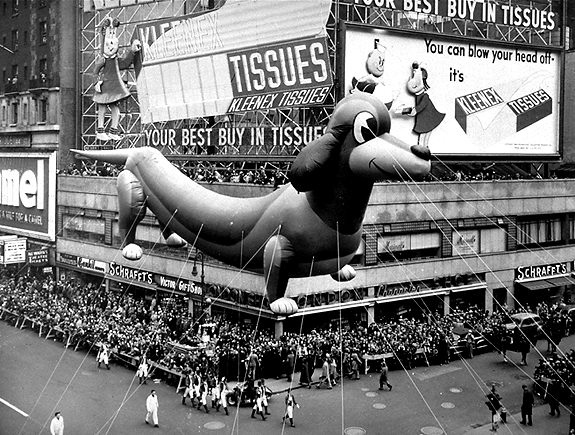 The Macy’s Thanksgiving Day Parade of course! It was so exciting to see the bands, the Broadway acts and most importantly the floats! I remember listening to my mom and grandma buzzing around in the kitchen as my Dad was “tasting” the rum punch while we kids were glued to the TV watching the parades. We would always have a major debate over which was the BEST float. My brother liked the Bullwinkle one. My cousin was partial to swimmingly cute Pink Panther. My other cousin always voted for Snoopy as her favorite. My favorite was Kermit. I remember watching this interview on TV as a kid! 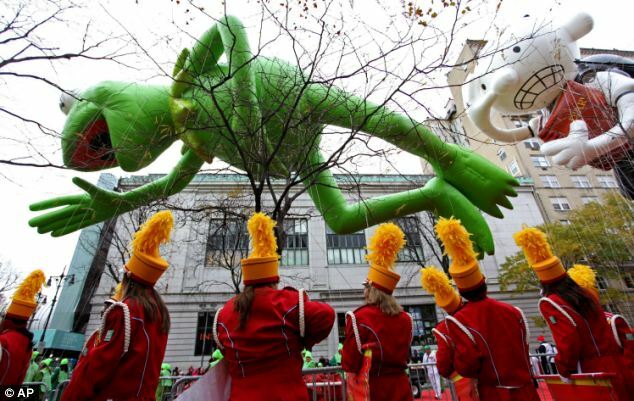 I’m sure with his new movie, Kermit will make an appearance in tomorrow’s parade! 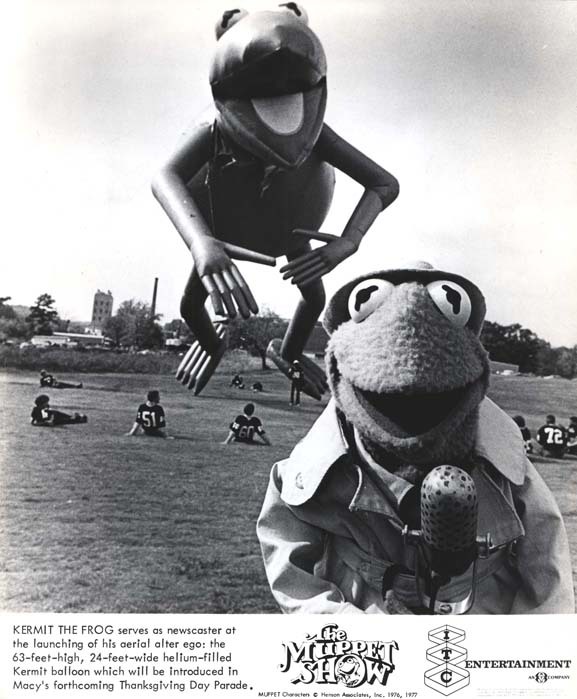 Here’s Kermit in action on a past T-Day. He is looking a little wrinkly in this picture, so it must have been a colder year. I love the awestruck high school band looking on. I’d be awestruck too. 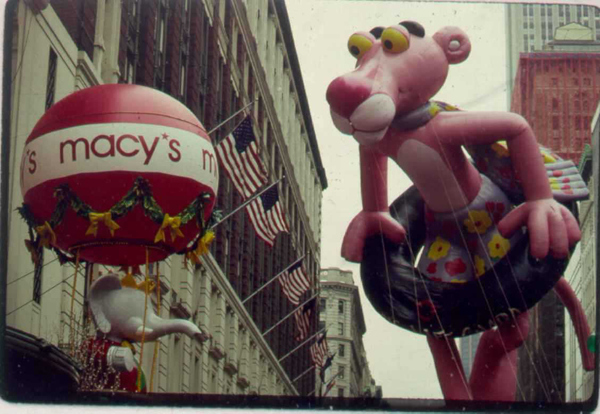 The adults would drop into the den and reminisce about their favorite floats from their childhood when their parents would take them into the city to watch the parade. I like these older floats as they don’t seem as commercially driven as the ones we see today. Photos from Grand Life Hotels, How to be a Retronaut, Buzzfeed, MidcenturyMania. And of course SANTA. Even my parents remember Santa being a BIG DEAL when he finished up the parade. 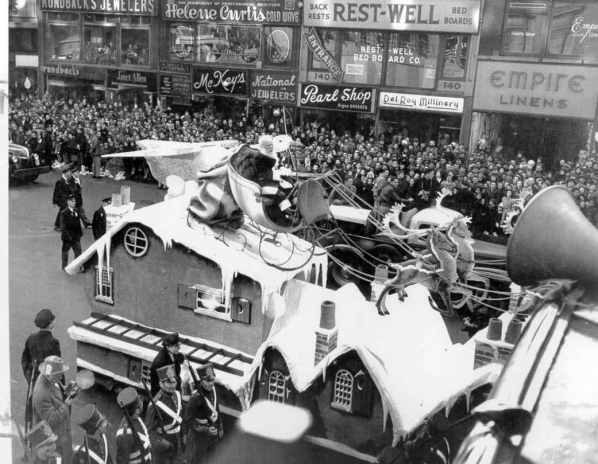 For me, there is something still magical about ending the parade and seeing SANTA coming. To me, it was the official beginning of the holidays and I could squeeze as much holiday day joy out of the next month as possible. You can’t help but walk a little lighter on that day. I hope I can watch a bit of it tomorrow with the Peach. 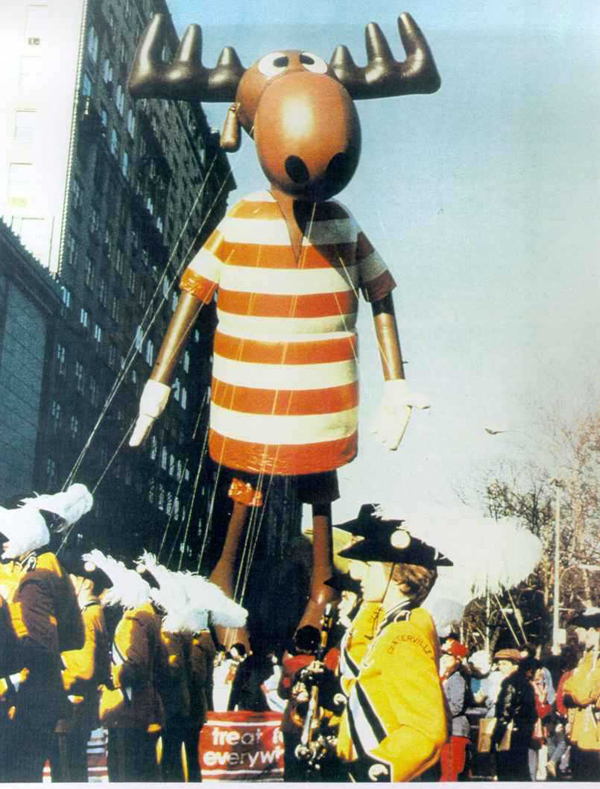 Did you watch the parade when you were a kid? Do you plan on watching it tomorrow? 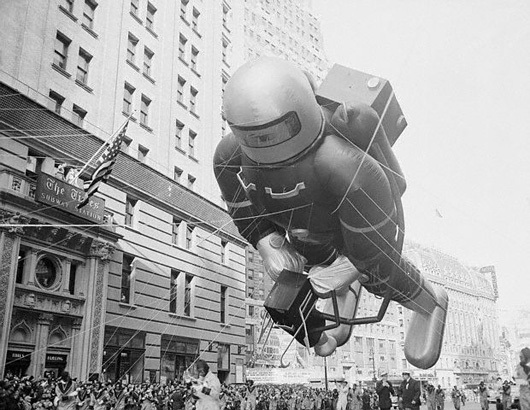 Posted in Vintage Photos, Vintage Pop Culture. The wiener dog!! THAT HIPPO!!! Why can’t they be more like this these days?! Tracy, I was thinking the same thing! I love the older ones so much! Check out the book Balloons over Broadway by Melissa Sweet. 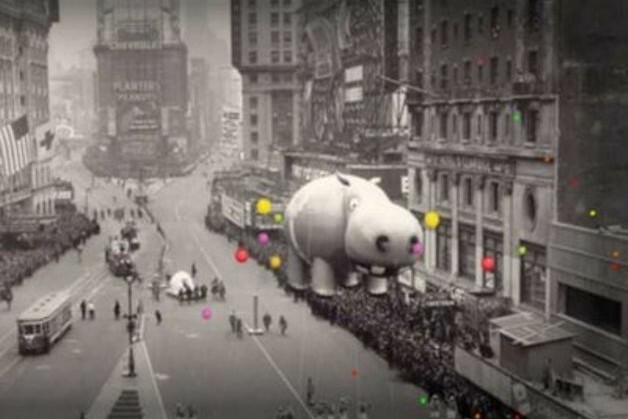 Really cute and interesting look at the invention of the balloons. (And get a fair bit of pre-Caldecott buzz, fwiw). Forgive the librarian for jumping on board… (Kermit’s my fave, too). Thanks! Will do! We love librarians, Genevieve! I moved to Canada when I was 19. 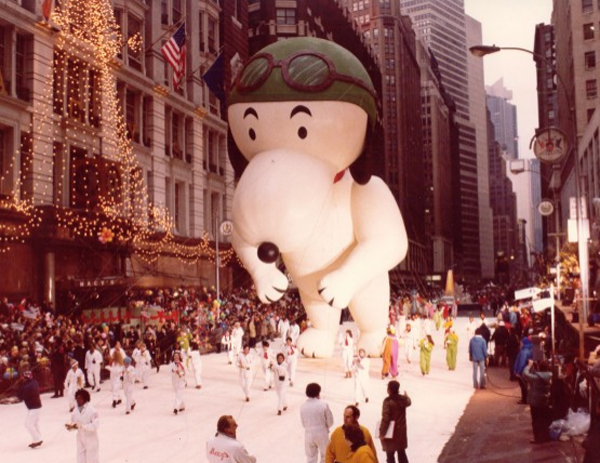 For the 13 years that have followed I mourn every single American Thanksgiving because I am missing the Macy’s Thanksgiving Day Parade. 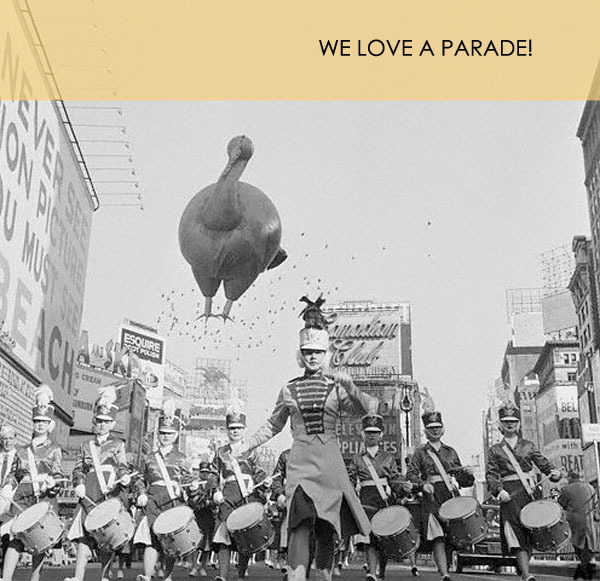 For me Thanksgiving just isn’t Thanksgiving without the parade. My Canadian friends just don’t get it. I think my favorite balloons were Kermit, Snoopy, Charlie Brown kicking the football and Ronald MacDonald, that balloon just looked so HUGE! Crystal, I’m so glad you liked the post, lady! And I understand your feelings for the parade! It really is so wonderful! I always loved the Rockettes!! AHH! Jill! I thought I included a picture of the Rockettes! I’ll add one JUST for YOU! 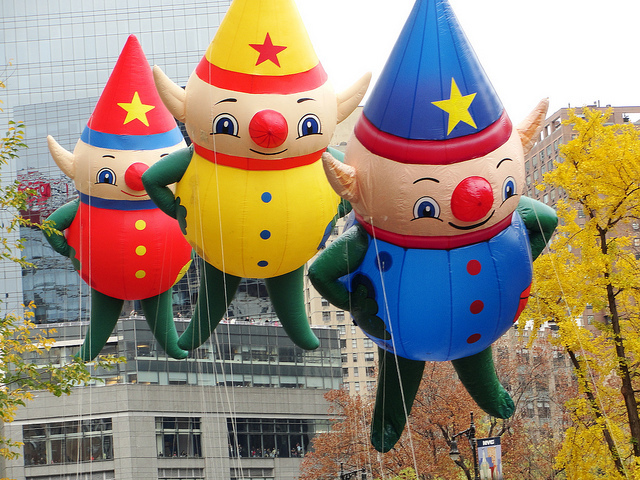 i love the Macy’s parade! Elizabeth–that just reminded me so much of my Grandma–she loved the parade and all the Hollywood glamour of it! That Kleenex ad behind the weiner dog slays me! I love the parade and my girls love seeing Santa! Ummm. THAT IS HILARIOUS! I didn’t even notice that Briana! Great catch. Oh, Little Lulu flogging Kleenex! Oh, Rockettes are on right now! I’m thankful for this website. Love getting my retro, childhood fix everyday. Have a beautiful day. Alice, we are so thankful for you and every reader who “gets” our retro childhood love. Happy Thanksgiving, Alice!